Ever since I came back to the Philippines early this year, I never really had the chance to visit the beach nor one of our glorious crystal blue waters due to my busy schedule — which is a bit harrowing because I did make it as my #1 item on my to-do list. So when the newest hit craze spot, Inflatable Island, messaged me and asked if I wanted to visit them (on dates in which I was timely free) to try their beach AND water playground, it was as if they knew that I was slacking off! Hence, it was easy to say YES after that invitation, especially because it would also be my first time in trying such a thing. Speaking of which… what is Inflatable Island exactly? 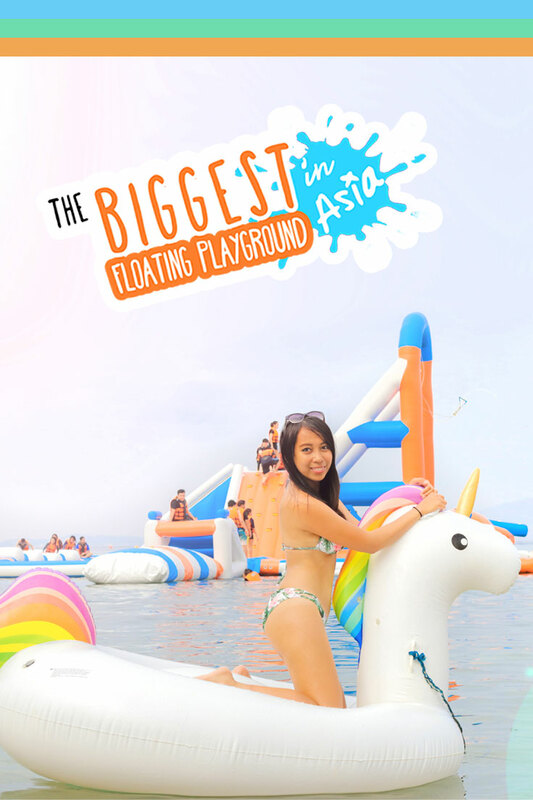 It claims to be the BIGGEST floating water park in Asia and that sure is, because this 3,400 sqm of inflatable goodness is as big as 8 basketball courts put together side by side! But it’s not all fun and games because it’s loaded with fun challenges and obstacles too given its playground-like features that have a water-y twist. So do expect an array of swings, trampolines, monkey bars, slides, wiggle bridges, ladders, ramps and even a HUGE iceberg! To amp up the excitement even more, they also put a 10-meter high Tarzan swing and a 9-meter human launcher! It might have become apparent to you now that this is like a place of fun that can be substituted for a workout — I swear, after I spent a day here, my muscles were sore (which reminded me to stop skipping my gym trips). Nevertheless, I enjoyed my time here and I would absolutely recommend it for you, your friends and/or family as a must-do trip this summer! ◘◘ How can I get to Inflatable Island? See my ‘Pre-Travel Guide’ below. ◘◘ Can kids come and play? Sure thing! But take note that there’s a height requirement in order to play at the Inflatable Island and it’s 3 feet. Also, for younger kids, they require a 1:1 adult kid ratio to ensure the safety of the young ones. ◘◘ Can I bring my own food and drinks? Unfortunately, you can’t. But don’t fret, they have stalls at Bali Lounge where you can buy food and drinks. (For Samba Beach area, they have a corkage fee that starts at Php 500 for 1-7 pax). ◘◘ How deep is the water? What if I can’t swim? It’s about 4 to 15 feet, that’s why once you go to the inflatables, it’s a requirement for everyone to wear life vests, no matter if you’re good at swimming. Rest assued, they have tons of life guards who are on duty at the inflatables. 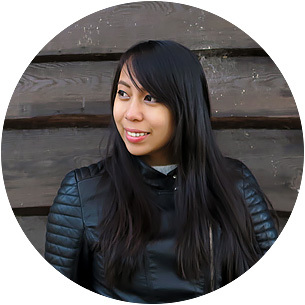 ◘◘ Can I use a selfie stick while I’m on the inflatables? Yes, they allow action cameras, selfie sticks, and any kind of gadget. However, it’s your responsibility to waterproof it all and of course, it’s advisable to attach a floating device to your tech gear because the management would find it hard to retrieve sunken items. (Because of the material, sharp objects or anything that could damage the Inflatable Island is not allowed). ◘◘ Are there lockers for storing my stuff? Yes! Rental fee for the big lockers is Php 100 (half day) and Php 150 (whole day). As for the small lockers, it’s Php 50 (half day) and ₱100 (whole day). ◘◘ Is there a first aid area? Yes, it’s right beside the spot where you will claim your life jacket. As I’ve also previously mentioned, there are a lot of life guards on the inflatable area; after all, ensuring everybody’s safety is Inflatable Island’s priority (apart from ensuring everybody’s enjoyment -wink-). ◘◘ What should I wear once I’m on the Inflatable Island itself? Swimsuits, board shorts, bikinis, speedos, etc. can be worn. But they do HIGHLY recommend the use of rash guards and/or swim leggings to prevent sun burns and rashes — besides, this is a slip and slide adventure! Additionally, make sure that you’re not wearing anything with buttons, zippers, or any sharp objects. This also includes earrings, watches or rings since it might damage the inflatables. Once you’re on shore, naturally, you may wear whatever you desire! The fun doesn’t stop at the water in Inflatable Island because once you get a hold of their pass, it instantly grants you access to their Bali Lounge for a whole day. So before and after you set foot on their inflatables, you can have your swell time hanging around at this lounge which has colorful umbrellas and bean bags (great for those Instagram-worthy photo ops too!). And when you get struck by thirst, you can order for some drinks and fruit shakes that are often served in cute cup floaters. For those who are looking for unique eats, make sure to try their Roccoloco Bowls. NOTE: Since space is limited in the Bali Lounge, it’s a first-come-first-serve basis. No worries because there are extra ‘normal’ chairs and tables nearby. 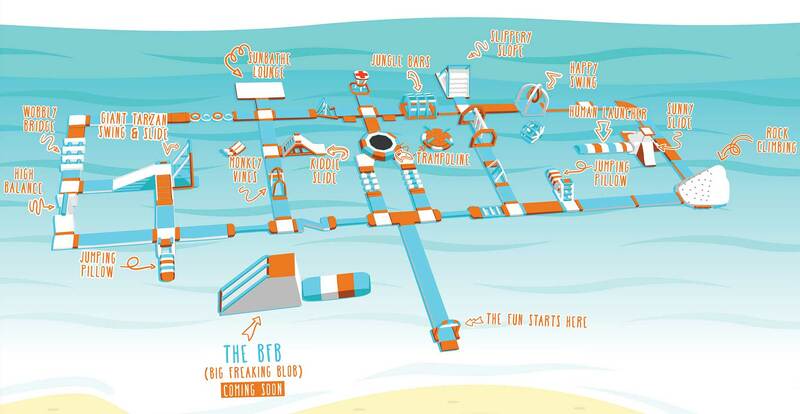 To add more to the number of ‘perks’ that you’ll receive by buying a pass for Inflatable Island, access to the adjacent Samba Beach is also FREE! Rest assured, if in case you’re coming with a big crowd, you can book a cabana (or wooden open cottage) beforehand. No sweat! How to get to Inflatable Island? From Manila, head to NLEX (North Luzon Expressway) to SCTEX (Subic-Clark-Tarlac Expressway). Take the Subic Bay Freeport Zone exit, and then take a right to Rizal Highway. Take a left at Burgos Street (beside Remy Field) and go right to Canal Road. Keep following this road until you reach Dewey Avenue. Exit to Kalaklan Gate (way to Zambales). Turn left, and then keep straight for 2 to 3 minutes until you see the Samba Bluewater Resort (formerly Subic Halfmoon Beach) — and that’s it! You’ll find the Inflatable Island ticket stall and entrance inside. *Parking is FREE but space is subject to availability (first-come-first-serve basis). It opens at 8:00AM and closes at 6:00PM. How much are the tickets or passes? 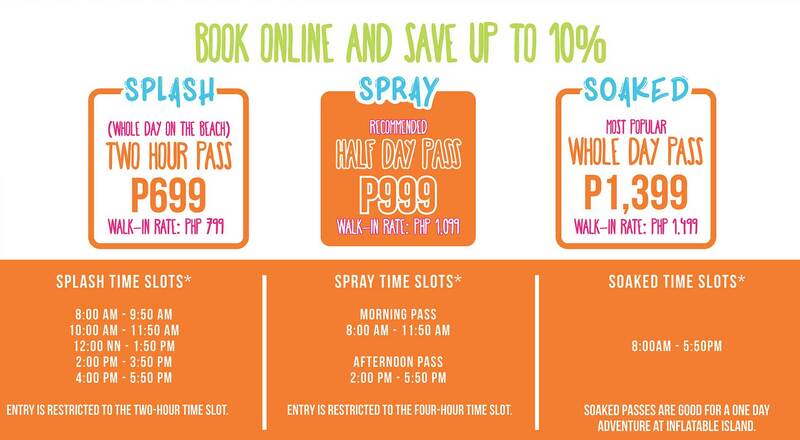 You can buy tickets on-the-spot at Inflatable Island (limit of 250 pax for walk-ins), however, you can SAVE up to 10% when you book online! It’s a lot better too so that you can save your spot in advance. Make sure that you arrive 30 minutes before your scheduled time to make room for sign-in process, safety instructions and life vest fitting. In my opinion, getting the Splash Pass is the best deal because 2 hours in the inflatables is more than enough (especially as a first timer). Though you might not be able to complete the whole course, I promise you, it can get a bit tiring so that time frame is just about right for all the water fun. Best time slot would be the 8AM or 4PM slot wherein the sun isn’t at its harshest. (If you pick the 4PM slot, you can arrive way before since the passes all grant a WHOLE DAY access to the Bali Lounge and Samba Beach — of course, it gives you access to the inflatables within your time slot only). What hotel to stay in Subic? If you’re interested, Inflatable Island can package your stay and inflatable passes with their partner hotel, Subic Bay Peninsular. Feel free to inquire with them! It should be apparent to you by now why I am highly recommending this place: it’s an insanely fun AND unique experience that can be quite an exciting challenge which you can share together with your family and friends! Couple it together with their vibrant Bali Lounge, and you’re in for a treat as you get the chance to have front row seats that give you grand views not only of the inflatables but of Subic Bay’s beautiful sunsets too. HAVE SOME WATER FUN NOW! What do you think of Inflatable Island? Would you like to try it out? Why or why not? Or have you been here before? How was it? A very useful article to read. Thanks a lot for sharing this. Fine work.Keep it up. Gonna come here this May! I love the Pink Bali Lounge.